Singapore Airlines (SIA) Boeing 787-10 9V-SCA’s arrival at Changi Airport after its epic ferry flight from Charleston, via Osaka Kansai, was indeed a cause for celebration. Not only did it mark the first delivery of a 787-10 to an airline customer anywhere in the world, it also made SIA the first airline group to have all three Dreamliner variants in its fleet, with the 787-10 in Singapore Airlines colours joining the bright yellow -8s and -9s already flying with its low-cost carrier unit Scoot. Add to that the launch of some new cabin products, such as flat beds for business class, and it is easy to see why the official arrival event drew a sizeable crowd of special guests, airline executives, suppliers and a host of local media alongside their international counterparts brought to Singapore courtesy of SIA, including Australian Aviation. The festivities represented the beginning of a new era at SIA. The 787-10, with its improved seats and cabin amenities compared with older aircraft it is replacing, will allow the airline to resume capacity growth and take up the fight to its competitors on regional and medium-haul routes. The morning of March 28 2018 also represented the culmination of more than a year’s work across the whole company, from the engineering teams preparing to maintain and service a new fleet type, to the pilots and cabin crew responsible for operating the aircraft. Add to that SIA’s product development team’s work with Stelia Aerospace to heavily customise the new business class seat, which offers direct aisle access and lie-flat beds for passengers on an aircraft SIA plans to serve destinations no more than eight hours away from its Singapore hub. Australian Aviation spoke to a couple of key players at the official arrival event about this collective effort to bring the 787-10 to Singapore. Singapore Airlines pilot-in-charge for the 787 Captain Ian Cheng operated the Osaka Kansai to Singapore leg of the delivery flight. Having previously flown the 777, Captain Cheng is among the first 19 of SIA’s qualified instructors and line captains to fly the 787-10. The first training sessions for the 787-10 began in February, with the “differences course” as it is known lasting about three weeks, interspaced with rest days and ground training. Singapore Airlines expected to have 80 pilots qualified on the 787-10 by the end of May. 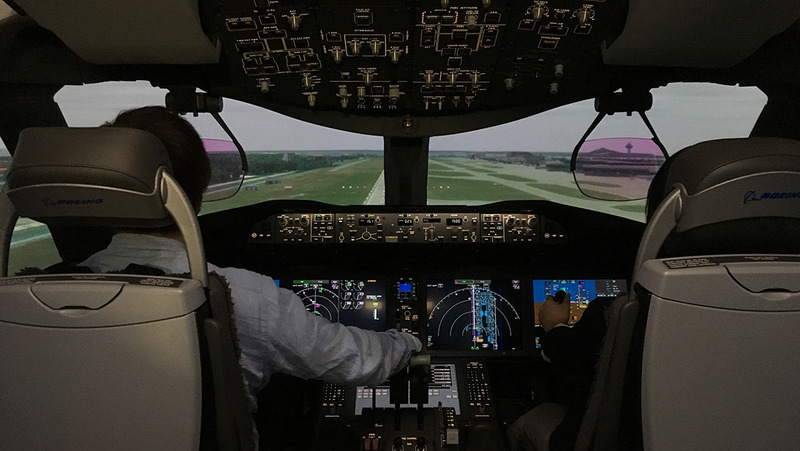 There was simulator training in Singapore, as well as some aircraft flying on the 787-10 at Boeing’s North Charleston, South Carolina facility. “The similarities of the 777 and the 787 is very close, probably about 80-90 per cent similar,” Captain Cheng explained to Australian Aviation on the flightdeck of 9V-SCA shortly after landing in Singapore. SIA officially took delivery of its first 787-10 on March 15. However, the aircraft did not leave Charleston on its delivery flight to Singapore until March 26 with a host of special travellers including chief executive Goh Choon Phong and Boeing Commercial Airplanes senior vice-president for Asia Pacific and India sales Dinesh Keskar, on board. In between, Captain Cheng and his colleagues did some crew flying with the aircraft, including numerous 20-minute flights between Charleston and Myrtle Beach, which are only 73nm apart. “It is just to get ourselves qualified,” Captain Cheng said. Since that first delivery, SIA has taken a second 787-10 and begun commercial flights to Bangkok and Kuala Lumpur. And there are three more 787-10s planned for delivery in May. These flights will also help get more pilots, currently being drawn from SIA’s 777 pilot pool, qualified to operate the 787-10. And as a qualified instructor, Captain Cheng will be responsible for helping build up the number of qualified 787-10 pilots. “There will be an instructor and then there will be a trainee,” Captain Cheng said. “If I am training a captain, the captain sits here in the left seat and I am qualified to sit in both the right and left seat so I sit in the right seat. “If I am training a first officer, he or she is only qualified on the right-hand seat so I will operate from the left-hand seat. Singapore Airlines senior vice president for engineering Lau Hwa Peng said having Scoot operate the smaller 787-8 and 787-9 since 2015 has been of great assistance in preparing for the arrival of the 787-10. “Typically, if it is a brand new aircraft we would have to start at least two years ahead of the entry into service,” Lau told Australian Aviation in an interview. “For the 787-10, we have the privilege of already supporting Scoot on their 787-8 and 787-9. They started their 787 operations in 2014 so we already have three years of experience handling the 787. Nonetheless, there is a lot of preparation involved, including dealing with suppliers and the original equipment manufactures (OEM) to make sure spares were available, manuals were ready, and people were trained. While the bulk of the systems on the Dreamliner family of aircraft are the same, Lau noted the two key differences from a maintenance perspective were the -10’s landing gear, which features a semi-cantilever bogey to help move the centre of gravity slightly in order to achieve better rotation, and the air conditioning system owing to the larger fuselage. Replacing Airbus A330-300s and Boeing 777-200/200ER/300s with the 787-10 has also meant some changes to how SIA’s Engineering unit manages its staff, given the different maintenance profiles of these modern aircraft. For example, an A330 required a heavy maintenance check, which involves stripping the aircraft and engines down to their bare bones to inspect for corrosion and damage that cannot be seen in normal operations, every six years. The 787 requires a heavy maintenance, or D check, every 12 years. It is a similar story for the more regular A check, which is required every three to four months – a 777 needed to be in the hangar for three days, while the 787 could have its A check completed out on the flightline in 12-18 hours. “As a result of these modern airplanes, the heavy maintenance checks are spaced out a lot more so the Engineering Company would have to look at what other opportunities they can do in between to make sure they keep their workforce gainfully engaged,” Lau said. “Skilled engineers and technicians are hard to come by. So they will be trained on the new airplane in order to be able to work on the newer generation aircraft. Meanwhile, SIA’s Training Centre has added a 787-10 door and other assorted cabin furnishings to ensure its world famous cabin crew are qualified to work on the 787-10. A 787-10 course for cabin crew already qualified to work on other aircraft takes about three days. SIA’s 787-10s have 36 business class seats and 301 economy class seats for a total of 337. The airline expected to have eight of the type in service by March 31 2019. While earmarked for regional and medium-haul routes that range from the short hop to Kuala Lumpur to six- and seven-hour overnight flights to North Asia, SIA’s 787-10s will feature a new-design business class seat in a staggered 1-2-1 configuration offering direct aisle access for every passenger and which converts to a 76in lie-flat bed. This represents a significant upgrade from the angled lie-flat business class seats in a 2-2-2 layout without direct aisle access on the A330-300 and 777-200. The economy seats are nine-abreast and have 32in pitch, as well as the newest generation seatback inflight entertainment system in the SIA fleet. The new business class seats were officially unveiled to the world shortly after the aircraft landed at Changi Airport and represented part of a US$350 million investment in new 787-10 cabin products. In addition to the improvement in cabin amenities, the switch to the 787‑10 also represented a capacity increase of 18 per cent compared with the 285-seat A330-300s it is replacing. Further, the 787-10 has 27 per cent more seats than SIA’s 266-seat 777-200s. 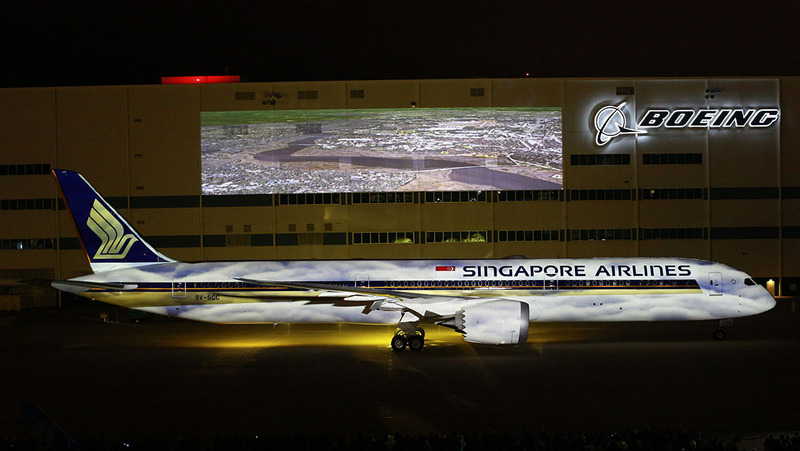 Singapore Airlines chief executive Goh Choon Phong said the 787-10 was a very important addition to the fleet. 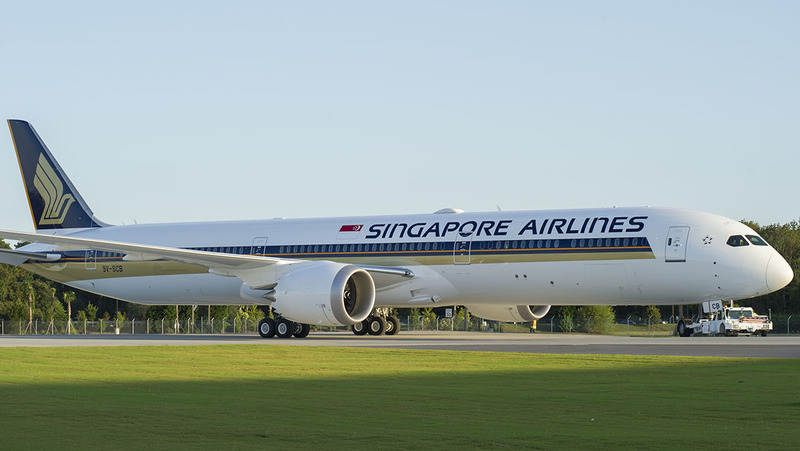 “I have very good confidence that it will set a new level of comfort for people travelling on medium-haul because the product we are having on the 787-10 is something that is even better than what others are deploying on long-haul,” Goh told reporters in Singapore shortly after stepping off the 9V-SCA delivery flight. “When we introduced the A350 we said it was a game changer because of the economics it can bring and the products that we can have on the plane. The 787-10, similarly, is going to be a game changer but this time around it is going to be for our medium-haul and regional routes. 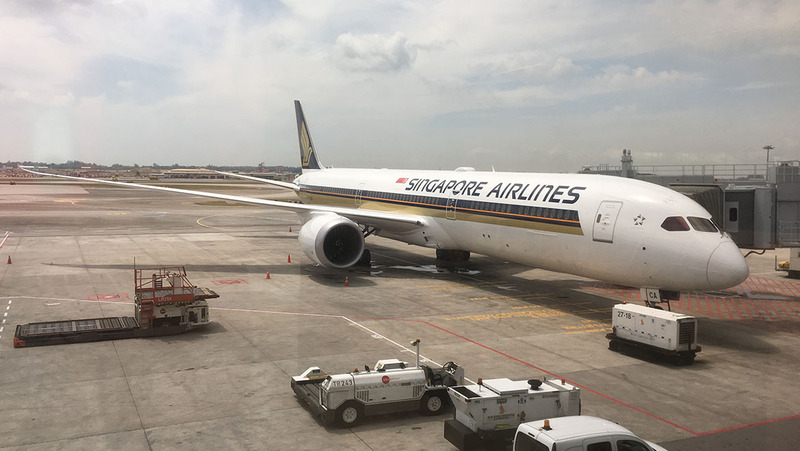 Aviation thinktank CAPA – Centre for Aviation chief analyst Brendan Sobie said the extra seats on board the 787-10 would allow SIA to increase capacity and reduce unit costs on some of its densest routes, particularly at slot-constrained airports in Asia. Sobie noted SIA had not been able to add capacity in a number of regional markets for several years, meaning the 787-10s represented the ability to catch up with demand, rather than getting ahead of an expected increase in demand. “SIA is confident that the increase in capacity is manageable, given the increase in demand for air travel to and from major Asian cities,” Sobie said in a research note published on April 3. “At several major airports in Asia more frequencies are not an option due to slot constraints, so the only growth option is upgauging. SIA began commercial service with the 787-10 on Tuesday April 3, when 9V-SCA flew the SQ970/973 Singapore-Bangkok-Singapore rotation, followed by a trip to Kuala Lumpur and back. After a month or so of short-haul flights for crew familiarisation and to allow pilots to build up hours on the type, its first scheduled medium-haul route for which SIA purchased the aircraft will be Singapore-Osaka, starting on May 3. Perth is the second announced scheduled destination for SIA’s 787‑10s, starting with a special launch flight landing on the afternoon of Monday May 7. Then from May 8, the SQ215/216 rotation will switch from A330-300 equipment to the 787-10. The flights are scheduled as an evening departure from Singapore, touching down in Perth just before midnight. After about an hour on the ground, the reciprocal SQ216 takes off a little after 0100 for an early morning arrival back in Singapore. Currently, SIA flies four times daily between Perth and Singapore with a mixture of Boeing 777-200/200ER and A330-300s. The change of gauge on one of those four flights’ aircraft represented a capacity increase of about five per cent. SIA has 49 787-10s on order with Boeing. And alongside Scoot’s 787-8s and 787-9s, the airline group is the first in the world to have all three Dreamliner variants in its operations. However, it is unclear if all 49 787‑10s will be delivered in SIA colours as the airline is also planning to take regionally configured A350‑900s from later in 2018, albeit with fewer seats and a likely different proportion of business class and economy compared with the Dreamliner. There is the possibility some of the 787-10s on order could be converted to the smaller 787-8 or 787-9 for further expansion at Scoot, or placed at the Scoot/Nok Air Thailand joint-venture NokScoot. CAPA’s Sobie estimated the 49 787-10 orders were likely too much for SIA’s own needs. Nonetheless, the aircraft represented a “fresh era of growth after a decade of flat capacity”. “However, SIA will need to manage the 787 fleet carefully, from a group perspective,” Sobie said. “Some network adjustments may be required to avoid too much overlap between Singapore Airlines and Scoot. “How many of SIA’s future 787 orders to allocate to Scoot and NokScoot will also need to be examined carefully. Goh said the 787 order book, as well as the profile of the rest of the fleet, was able to react to changing market conditions. “This aircraft is for growth of course, but at the same time it is also for renewal,” Goh said of the 787-10. The SIA chief executive noted the airline had not grown capacity to any great extent over the past six years due to the introduction of premium economy on its A380 and 777-300ER fleet, leading to a reduction in seats on a number of routes. But the recent deliveries of the A350-900 and now the start of 787-10 aircraft joining the fleet meant SIA was entering a “new phase of growth”. Following Osaka Kansai and Perth, SIA’s third route for the 787-10 will be Singapore-Tokyo Narita starting in mid-May. 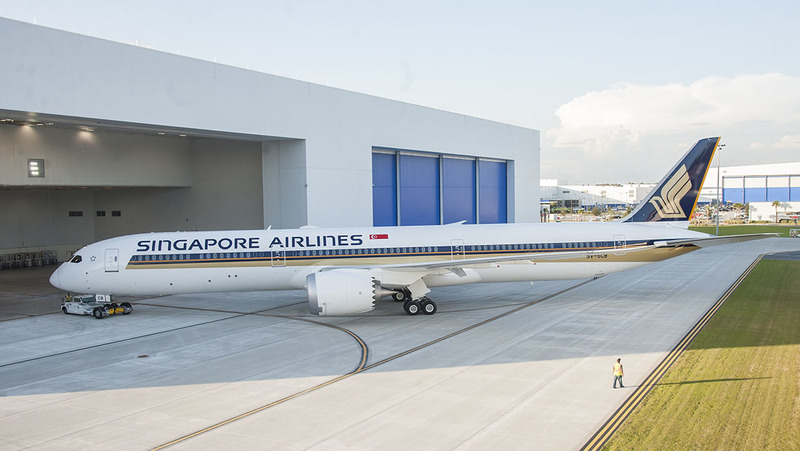 The first delivery of the 787-10 to Singapore Airlines represented the final chapter of the aircraft type’s development, with all three variants now in production and being delivered to airline customers. Currently, a combined 12 787s roll out of Boeing’s final assembly lines in Everett and South Carolina each month. The production rate will increase to 14 per month by the end of calendar 2018. All 787-10s are being built at Boeing’s North Charleston, South Carolina final assembly line. The largest variant of Boeing’s 787 program is capable of flying 6,430nm when configured with 330 passengers in a two-class layout, according to Boeing figures. VIDEO – Watch Boeing performance testing of the 787-10. At 68.2m, the 787-10 is a 5.5m stretch on the 787-9 that began flying in August 2014. The first 787 variant, the -8, made its commercial debut in October 2011 with launch customer All Nippon Airways (ANA). The 787-10 received its amended type certificate from the US Federal Aviation Administration (FAA) in late January, following a flight test program that kicked off in March 2017 and accumulated 900 test hours. Apart from SIA, airlines that fly to Australia and have ordered the 787-10 include ANA, British Airways, Emirates, Etihad, EVA and United. Boeing’s Keskar said he had no doubt the 787-10 would be a passenger favourite. 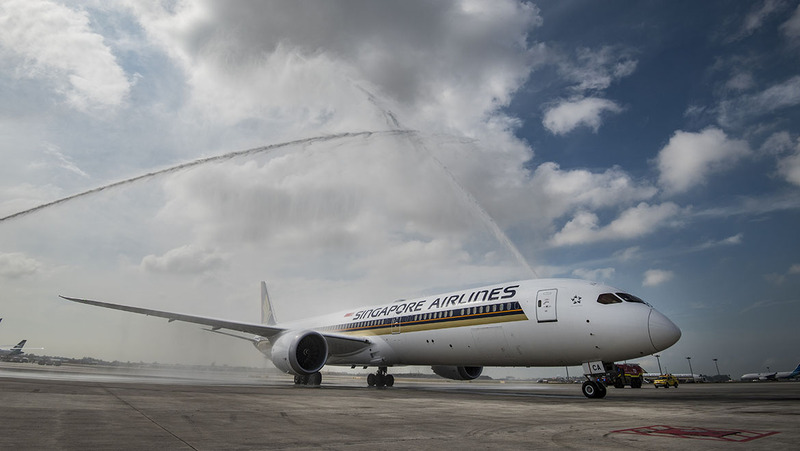 “I can attest that Singapore Airlines passengers are going to love flying on it short-haul, long-haul, medium-haul, anything they want to do with this airplane,” Keskar said shortly after stepping off the delivery flight. Keskar said the three models in the 787 family offered airlines the option of deploying a “different size of airplane depending on the route”. “You can start a route with the 787-8, as it builds and gets like a high load factor then you take that airplane out and move it to some other route building and put a 787-9 in there and you do the same thing with the -10,” Keskar said. “That’s why having this flexibility of -8, -9 and -10 is very important to the airlines. @Geoff Cropley, it might be more relevant when making a comment if you were to specify what you mean by liking the “oldset up” better. Do you refer to SQs maintenance procedures, or maybe the new SQ cabin layout and if so, specifically which? Business, economy? Having read the article and not actually travelled aboard this aircraft I would of course be interested in reading actual passenger feedback. Any chance of offering more specifics to your comment? Thanks. Interesting on new 787-10 but would like to know what engines on SA as well as other airlines. Most articles do not mention make of engines which I find interest. SIA Boeing 787-10s utilises the Rolls Royce 1000 TEN engine series. The engines are updated from the Package C engines which are currently causing blade problems to most operators so SIA should be largely unaffected. So where is Premium Economy? Will not get my dollar without it. Me neither Peter L. 9 abreast is OK is you are under 5 foot and under 65 kgs but not the average Aussie bloke. My $$’s go to any airline that has a decent Prem. Eycl and reasonable legroom. Oh my goodness, Singapore Airlines would have to be the one airline in MOST dire need of a new livery… no problem with the logo as it’s long standing but that livery is the most boring one going around, apart from the amateurish PRC efforts… seriously, the airline claims to have this fantastic reputation (much of it is hype of course) yet its livery looks like a second rate sixties effort. You mean the reputation that comes with it winning awards after awards and only bested by Qatar Airways as the world’s best airline? It’s hype is justified, even though their standards may have dipped compared to the past it is still leagues ahead of every airlines (except maybe Qatar Airways).